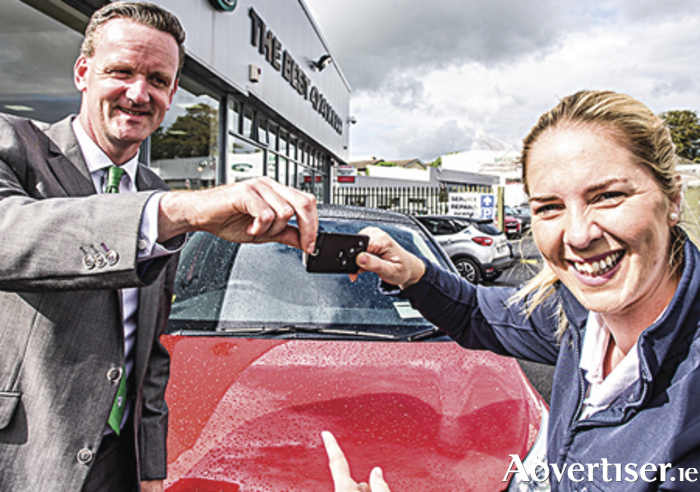 Joanne Murphy receiving the keys to the Renault Captur. Photo by Michal Dzikowski. Renault Ireland and Bradley Renault are delighted to announce Joanne Murphy as their new brand ambassador in the west of Ireland. Murphy, working fulltime for the Irish Cancer Society as community fundraising manager, is also the voice behind Tri Talking Sport, based in Galway. Her relatively new business has grown from strength to strength over the past two years, and Murphy has made a name for herself as one of Ireland’s leading voices in the sport of triathlon. Her high profile charity and sports work throughout Ireland makes her the ideal ambassador for the Renault Captur, the family crossover. The ‘Irish voice of ironman’, she works as the event announcer on the UK and Irish ironman circuit. Closer to home, she has officiated as the event MC at a number of high profile sporting and non-sporting events, including the Dublin City Triathlon, Rock n Roll Half Marathon Dublin, Galway Bay Half Marathon, Dublin City Marathon Expo, Galway International Oyster Festival, as well as various events for Athletics Ireland across the country. Murphy is also the chairperson of Galway Triathlon Club and a key player in the organisation of the Bradley Renault Giro D Galway. She said: “I am delighted to once again partner with Bradley Renault as their ambassador for the coming year. It’s a great opportunity for me to further the promotion of Tri Talking Sport, and a fantastic endorsement of what I have achieved to date to have the support of all the team at Bradley Renault. "The Renault Captur is a fabulous car and I love the signature version. It is sleek, sporty, and very economical. I’m looking forward to driving the high roads and byroads of the country in my 152 version." If you would like to take your very own Renault Captur for a test-drive, call to Bradley Renault on the Tuam Road or call it on 091 732300.